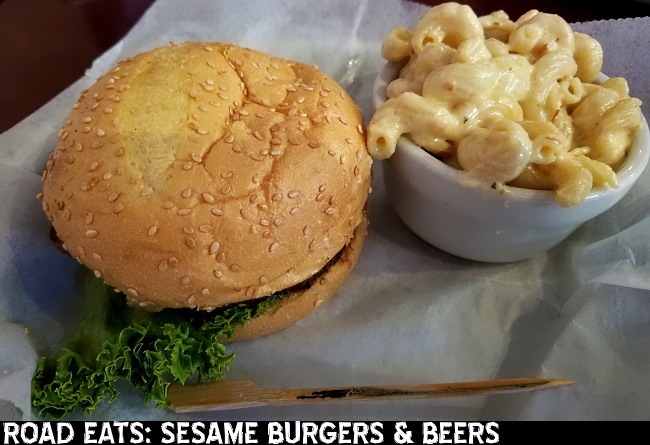 Sesame Burgers & Beer is a South Carolina burger joint with locations in Charleston, North Charleston, and Mount Pleasant (we dined at the Mount Pleasant location). In addition to burgers, Sesame Burgers & Beer also serves up tacos, sandwiches, salads, appetizers, and several kinds of alcoholic milkshakes. Pro tip: Sesame Burgers & Beer usually has a free appetizer offer on their website, so make sure you check it before you go. Menu: View the full menu here. What we had: Beet salad (sherry-orange roasted beets, mixed greens, roasted walnuts, carrots, pickled red onion, goat cheese vinaigrette) with a side of street vendor corn, Memphis burger (house made peanut butter, bacon, banana) and a side of smoked gouda mac 'n' cheese, and an appetizer of sweet tea brined jumbo wings. Cost: You can get a burger and fries for $9, but extras will drive the price up. The Memphis burger and fries, for example, will run you $11.75. What we thought: Different and delicious! These aren't your normal burgers and it shows. We loved Sesame Burgers & Beer and will definitely return the next time we're down in Charleston.